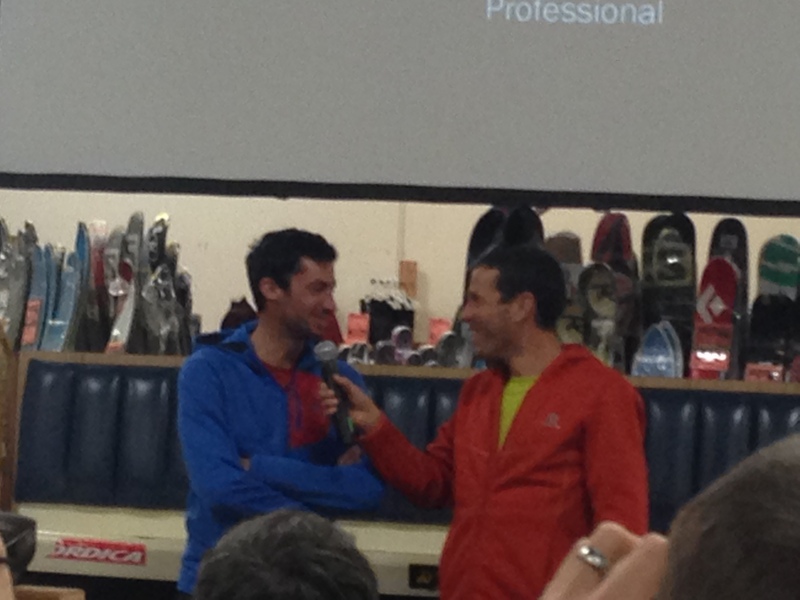 Last night, Jesse and I attended the Salomon International Trail Running Team at Sports Basement. On the heels of the North Face Endurance Challenge Championship, these elite runners spoke of their personal triumphs and tribulations in between snippets of inspiring video clips featuring their gorgeous running routes (New Zealand, Colorado, the Alps) and running stories. Among those present was megastar Killian Jornet, the Spanish skier and trail runner who wins just about every insane mountain race he enters. Killian Jornet at Sports Basement last night. The free event was extremely well done: prior to introducing the team, the audience was treated to three different types of craft beers (a hefeweisen, an amber ale, and an IPA), as well as pulled pork sandwiches (for Jesse), pasta salad (perfect for carbing up), and greens. While Jesse and I spoke of how rare it is to find an event with not only free food and beer but also the opportunity to see running superstars in the flesh, he made a really good point: Sports Basement is one of the only forms of community many San Franciscans have. He’s right. 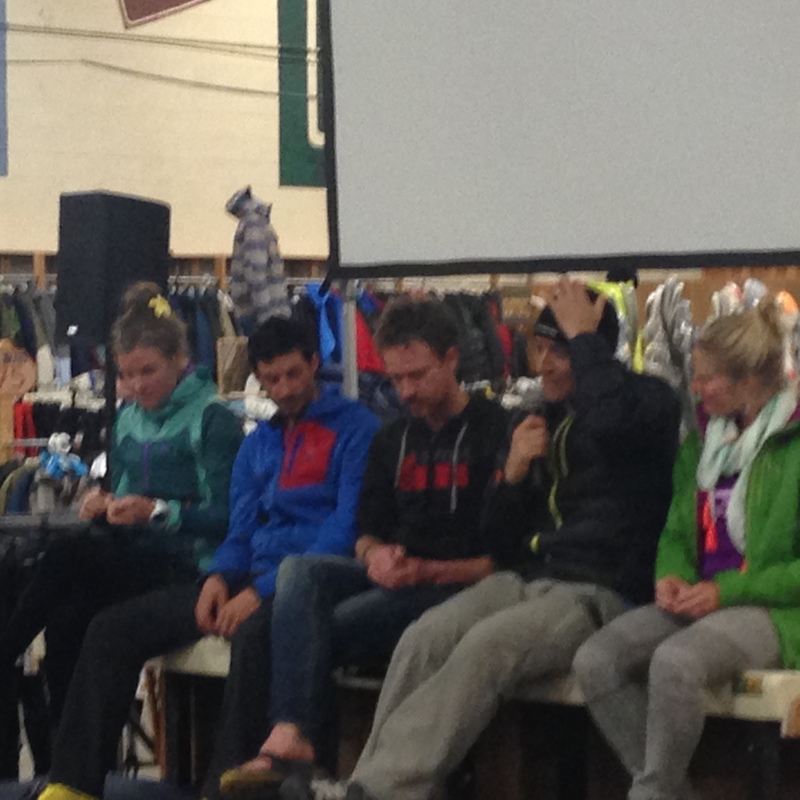 Among the compression socks- and Patagonia-wearing endurance athletes discussing pacing and fueling strategy during the beer and food hour preceding the event, a feeling of community and togetherness was definitely present. It seemed like the entire audience is running TNFEC this weekend and came to the event looking for inspiration and a copy of Killian’s book Run or Die signed by the runner himself. The running superstar panel answering questions. Despite the wind, rain, and frigid temperatures predicted for tomorrow’s race (a 45 degree high for San Francisco is totally unheard of), I’m excited to experience my first ultramarathon among these athletic giants. So glad to know you had a wonderful time at the event last night! See you at the starting line of the NFEC tomorrow! Very cool experience! Anything that involves running and free beer is ok in my book. I’m lucky to be friends with a small few elite runners and it’s always inspiring to be around them (and to pick their brains). Best of luck in your ultra!!! !